Updated on 2/13/2011: It looks like people were having problems with the download. I have updated this post with new documents. Please let me know if there are any other problems. 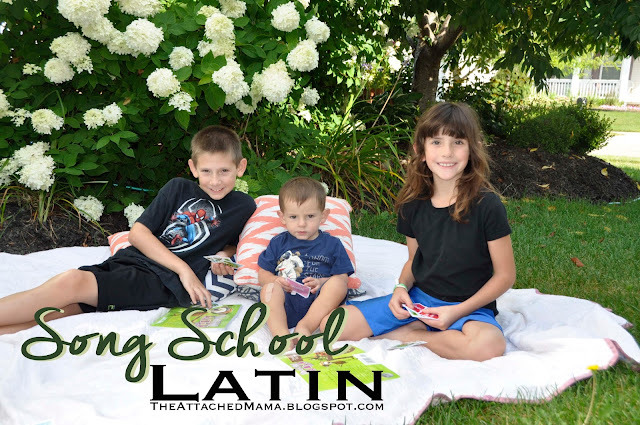 Sometimes keeping up with the work of running a household is NOTHING short of overwhelming. 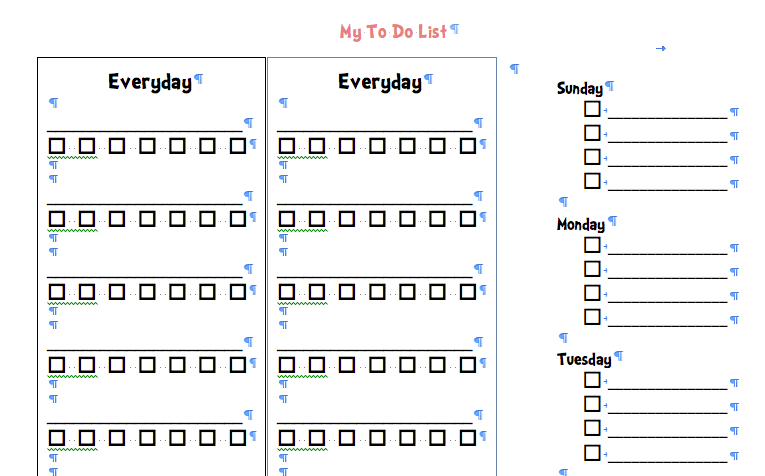 One thing that has really helped me to stay on top of things is by using a printable "To Do" list. Every Sunday I hang this list on my refrigerator as a reminder of what I need to get done in a given week. I kind of play a game with myself to see how much I can get checked off on any given week. It is a real motivator for me! 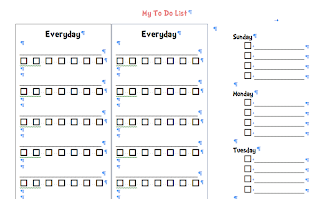 So, as my little gift to you, I present these printable "Busy Mom To Do Lists". (I have heard that they are equally effective for Busy Dads too!) I have provided three different options for you to choose from. 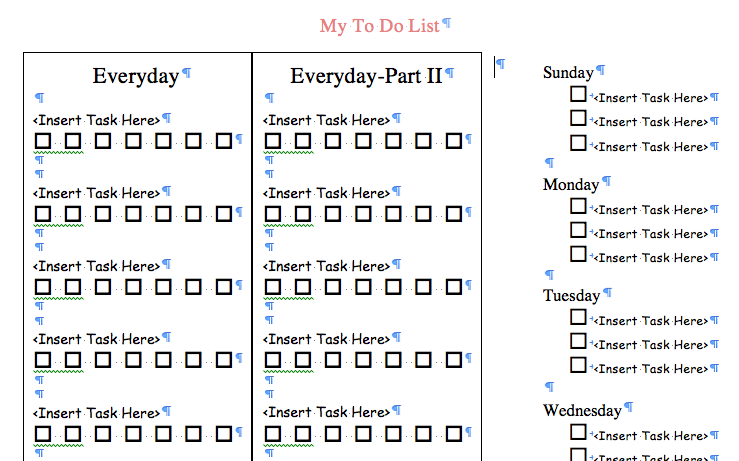 1) Already Filled-In Chore List- Need a "chore system" that is already put together? This is the exact list that I use at home. 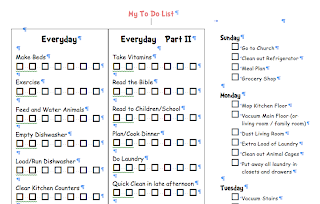 It has all of the chores filled in for every day, plus some room for you to write in any extra chores you have specific to your home. 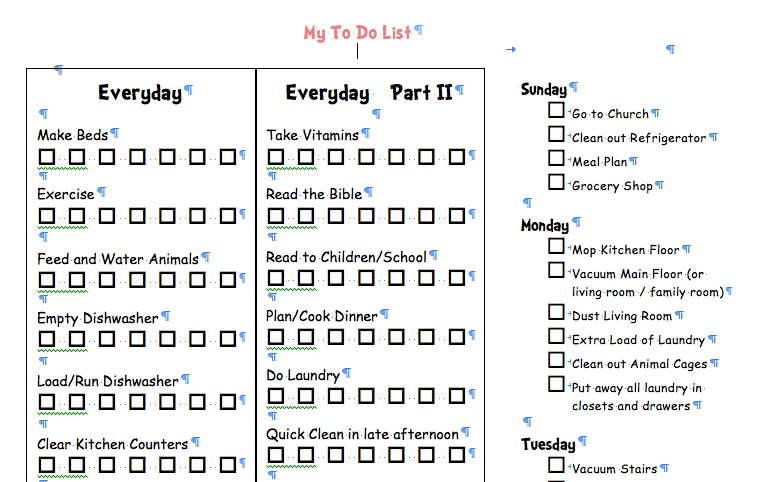 2) Blank Chore List- Do you want to move some chores over to different days? Are your chores completely different than mine? Well, here is a blank document that you can print and then write in your own chores on any day you want. 3) Electronically Editable Chore List- Do you despise writing things in by hand? Do you want a pretty chore list that you can hang on your 'fridge that is customized to your home? Do you want to pick your own fonts and colors? Well, here is a word documented that is pre-formated for you to electronically edit with your own chores. You may modify this any way you want. Just please do not remove my blog name. These documents may be modified and reproduced by individuals only. All I ask is that you please do not remove my blog name from the document. Also, if you found these documents helpful, please consider "paying it forward" by sharing this page on facebook, twitter, or your own blog. 2) Give yourself a break: I like to warn people not to fall into the "All of Nothing" mentality. You may NEVER get everything on your To Do lists done during the week. But the lists at least give you a goal to shoot for. So don't beat yourself up if you don't get everything on the list finished each week. In fact, I personally have never gotten every single thing checked off! I just accept that I am in the season of my life where I might not always have a perfectly clean house. Although the list gives me something to shoot for. So, again, don't give up or feel overwhelmed if you don't get everything checked off! Instead look at it positively and make it a goal to get as many things as possible checked off. The list is there to help you, not to add extra stress to your life. Focus on the positive--and how much you are getting done vs what you aren't getting done. That is really great!! Very simple and flexible.I like it! Now,if only my printer had ink! You could also laminate it and use white board markers! I look forward to ready the rest of your series. 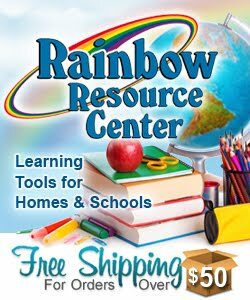 What an awesome tool to help moms. Bless You!! Can you please give me a tip on how to use the editable list? I can't seem to get it to work. Try it now. 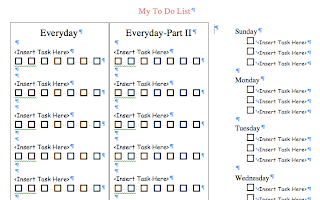 I have uploaded a new version of the Electronically Editable To DO list. If you want to edit it, please make sure you download the word document. Let me know if there are any other problems!! 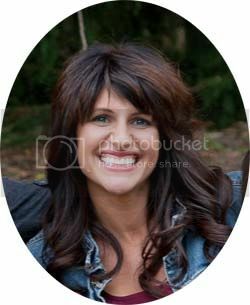 I know this is an old post, but I just discovered you blog while searching for organizing help for ADD moms. I LOVE your chore list, but I am having some trouble downloading the editable list. I can print it as is, but that's all.